I’m still working on clearing out my repurposing stash. Among the “junk” are some ceiling fan parts. I had this idea to make some animal wall art using the fan blade part, but I also wanted to make a functional piece too, so that’s when I looked at the brackets wondering how I could incorporate them with animals. Then it hit me, I’ll use the brackets to make a coat rack for my daughters’ room. I tested my idea by holding the bracket on a piece of lumber to see if there was enough room between the lumber and bracket to hold a coat or hat, and sure enough there was plenty of room, so the project proceeded, and thus I give you, How to Repurpose Ceiling Fan Parts into a Coat Garment Rack. Trying to choose the right animal to make for this project was easy. My daughters love the story of “The Three Bears”, and so I thought it would be fitting to make them a coat rack for their room with 3 bears on it. I cut the ends off each of the ceiling fan blades, on the miter saw. For this project I just used the ends of 3 blades. I had some cane left from some of the other fan blades I’ve repurposed. Scissors were used to cut the cane into bear ear shapes, and the ears were hot glued onto the back of the fan blade tips. Then I used a stencil brush to pounce paint on the fan blade to give it some texture. 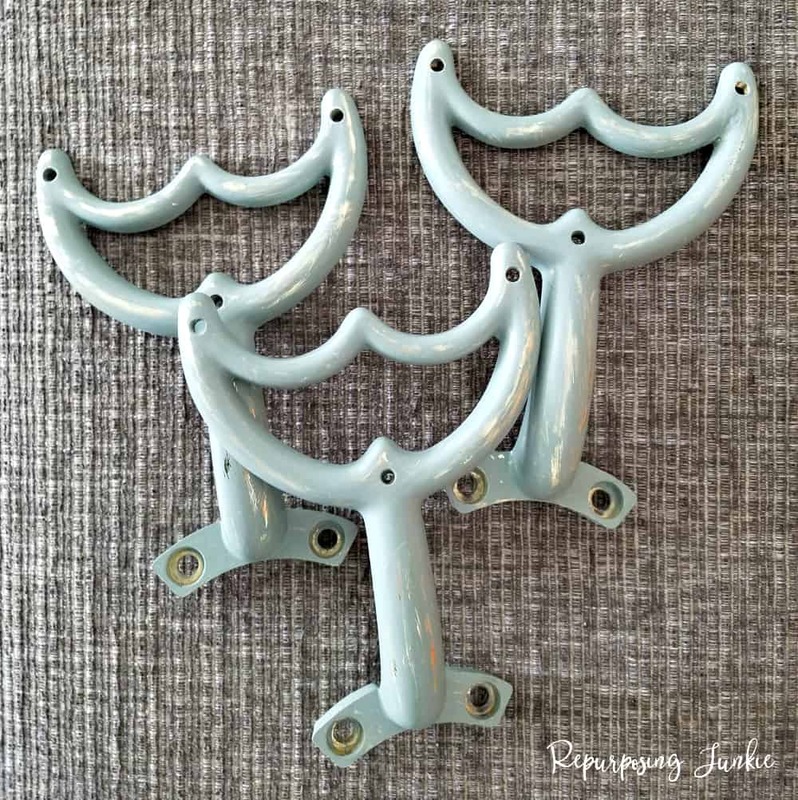 I have several of these ceiling fan brackets, and I got a few to become the coat rack hooks. I painted both sides of the brackets the green color I’m using in my daughters’ room. I also distressed the fronts a bit so the gold would show through some. My husband cut a cabinet door in half using the table saw. I attached 3 fan blade brackets onto the maple cabinet door using some spare screws. The cabinet door is actually from the same piece of furniture that these drawers are from, so it matches well with the vintage decor in the girls’ room. I also attached the bears onto the back of the cabinet door using very small screws, and again I just used some extras I had from previous projects. D brackets were then fastened to the back so it can be mounted on the back of their bedroom door. I added my flower garland stencil to the edge and coated the cabinet door with dark wax. Voila, it’s ready to hold coats, hats or little purses. So what do you think? 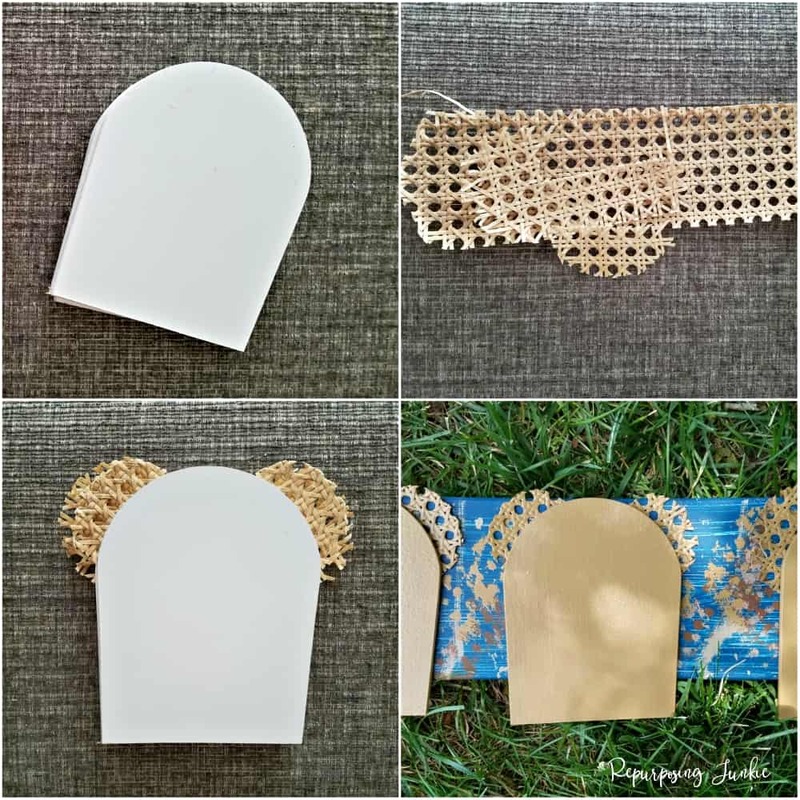 Thanks so much for sharing, How to Repurpose Ceiling Fan Parts into a Coat Garment Rack! Aww this is so cute. I love how you come up with all of these projects that are so child friendly and appeal to the little ones. Too many times we decorate without taking their favorite characters into consideration. Love how your mind works and how you came up with that idea for the hooks. Thanks so much Mary! It’s fun to bring their favorite characters into the décor. Neat idea! Never would have thought turning a fan blade into a coat rack! – GENIUS!! Very clever Keri, and oh so Cute! I never would of thought to use the brackets as hooks. What a fabulous make! And …all from ‘junk’! I love how you transformed those fan blades into the most amazing decor!!! I would never have thought to turn those brackets into hooks either…brilliant!! I’m going to be on the lookout for some…you got my wheels a turn’n!!! ? I think the hooks themselves look like whale tails, and I could see theming the coat rack nautical. Yes you’re right they do. What a great idea Marilee! How do you come up with such fabulous ideas? It is adorable Keri, and that’s what I call repurposing at its best! You don’t leave any piece of the ceiling fan without a new purpose.